OWNER GROOMS HER WEEKLY... BEST IN CLASS!! WIND TRAVELER is a "ICW Friendly" BLUE ALGRIP HULL 2003 one owner (Bought off the Chicago Show-Room-Floor), 3 cabin JEANNEAU Sun Odyssey 45.2 with Master berth forward for owners stateroom. Equipment includes; 3-Blade MAXIFOLD PROPS with Cutter, ELECTRIC WINCHES, ELECTRIC HEADS, UPGRADED YANMAR ENGINE,Quantum Cruising SPINNAKER, SPARE SAILS, 15,000 BTU's reverse cycle A/C. Dodger. Bimini. Full ENCLOSURE canvas, Delta Anchor, windlass with helm remote & Chain counter, ground tackle, GENERATOR, furling main and genoa, KATO DAVITS with OB eng hoist, NEW HOSES, and much more. See listing for complete details. The Jeanneau Sun Odyssey 45.2 has earned an international reputation as the leader in her class. West Florida Yachts would love to guide you through a personal showing of this 46' Jeanneau Sun Odyssey 45.2 2003. 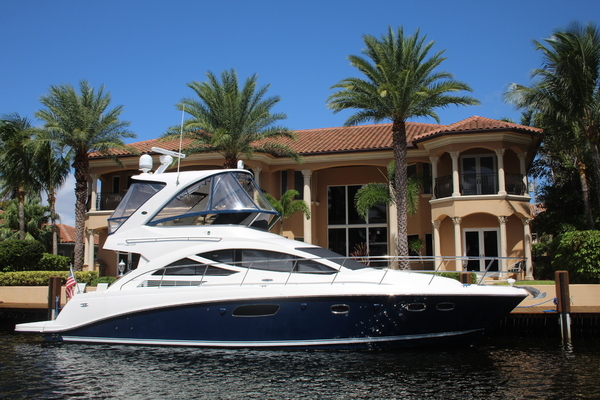 This yacht for sale is located in St Petersburg, Florida and priced at $175,000. For a showing please contact us by filling out the form on this page and we will get back to you shortly! Aristo blue Awlgrip hull with white cove and boot stripes. Meticulously maintained, single (1) owner. Dodger & Bimini with connector and FULL cockpit enclosure. Sunbrella hatch and grab rail covers. KATO Explorer Series davits with reinforced transom. Outboard mount on port aft rail. Chrome Dorades with stainless rails. Roller furling Main and Genoa. Two chair option salon seating. Optional deluxe teak table in salon. Mattress battens with Tempurpedic foam cover. Brass Weems and Plath tide clock and barometer in salon. Four burner propane stove with oven. Upgraded Frigaboat refrigeration/freezer with stainless condenser plates and digital controls. Two JABSCO ELECTRIC HEADS, two showers, two sinks. Two large capacity holding tanks. Main tank with Y Valve overboard discharge option. Overboard pump on forward holding tank. SHARP TV with DVD player. TV antenna. Sony AM/FM radio with CD player and XM satellite service. Two optional opening portals in salon. CruiseAir 10,000 BTU with reversing feature forward. CruiseAir 5,000 BTU non reversing aft. Ten gallon water heater (2014). Very large, comfortable cockpit – dual helm. Two 10# propane tanks under port helm seat. Optional deluxe teak cockpit table with Sunbrella cover. Leather wrapped wheels with Sunbrella covers. Teak, screened companionway doors with weatherboard option. Teak cockpit seats and deck. Full set of BOTTOMSIDER cockpit cushions with riser for helmsman. Teak table extension for Garmin Chartplotter. Quantum Cruising Spinnaker with dousing chute. Lightening brush with grounding cable. Upgraded stainless life lines (2012). Two electric Harken primary winches (48.2). One electric Harken cabin top winch. Large sail locker at bow. Yanmar 75 HP (UPGRADED turbo diesel with 2100 hours). Three LIFELINE 31 AGM house Batteries. One 31 AGM cranking battery. Three (3) Blade Maxi Prop with cutter spur. NextGen 5.5 KW generator with 2 cylinder Kabota diesel. Raytheon ST60 TriData (depth, speed, wind) repeated on second helm. Raytheon RL70 Chart Plotter at Navigation station. Raytheon 2KW Radome antenna w/mast mount. Raytheon ST6001 Plus Type 2 Autopilot. Garmin 3200 chart plotter at helms. Second Garmin depth sounder as back up to Raytheon. ProMariner ProSafe 60 amp galvanic isolator. LoFrans windless with HT gypsy and control at bow. Quick chain counter/anchor control at helm. 60# CQR anchor with swivel. 200 feet of HT chain plus 150 feet of rode. Sunbrella bag of additional rode. Wash down pump in anchor locker. The Sun Odyssey 45.2 is an impressive sailboat that represents the harmonious balance between performance, comfort, and elegance. Fine entry lines, a responsive and quick hull, and an unencumbered deck layout with twin steering wheels in the large cockpit make this boat a dream to sail and spend time on. The interior is a prime example of quality and comfort. This is a 3 cabin/2 head layout. Standard below is an immense navigation station to starboard, bookshelves, lots of storage compartments, a big galley with an expansive countertop, and a huge saloon with a deluxe folding salon table, built in liquor storage cabinet and two (2) deluxe movable salon chairs across from the large U-shaped settee. The impressive forward owners's cabin, with an island double berth will impress you with its stowing capacities (shelving, cupboards, and a large drawer under the berth). The spacious head compartment is equipped, along with the standard equipment, with a shielded shower area and custom teak floor grating for comfort and safety. Aft are twin staterooms that provide ample storage in hanging lockers and huge double berths. Fans & smoke/mono detectors throughout.